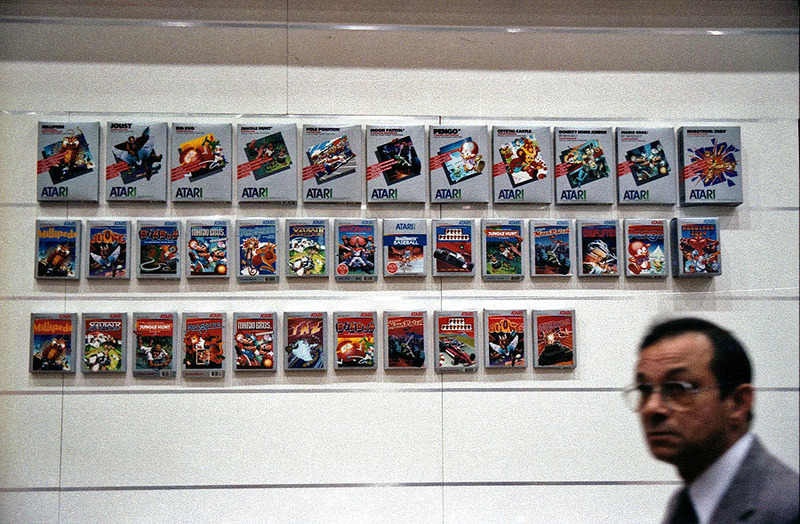 Here were the new games Atari was showing off at this show. Most were developed by GCC. Top row: Millipede (ours), Joust (ours, in fact mine), Dig Dug (ours), Jungle Hunt (don't remember), Moon Patrol (don't remember), Pengo (not us), Crystal Castle (not us), Donkey Kong Junior (don't remember), Mario Brothers (not us), Robotron (ours). Middle Row: Millipede (ours), Joust (ours), Dig Dug (ours), Mario Brothers (not ours), ??? (not ours), Xevious (ours), Berserk (ours), Baseball (not ours), Pole position (ours), Jungle Hunt (don't remember), moon patrol (don't remember), Choplifter (ours), Pengo (not ours), Robotron (ours). Bottom Row: Millipede (ours), Xevious (ours), Jungle Hunt (don't remember), Kangaroo (don't remember), Mario Brothers (not ours), Taz (not ours), Dig Dug (ours), moon patrol (don't remember), Pole position (ours), Joust (ours), Battlezone (ours). 14.Robotron (ours)***Are you sure? Judy Bogart. Millipede for the computer and the 5200 was written by Steve Crandall of Atari. The 2600 version was written by Dave Staugas of Atari. GCC did make a version of Millipede for the 2600, but Atari decided to release their version instead. I know that the 5th one is Kangaroo on the middle row. Did General Computer program the Pac-man port for the 5200? Just curious. We did Ms. Pac-Man - I don't recall a port of Pac Man. I think the bottom row are 2600 carts. Noelie (sp?) Alito and I did Moon Patrol. Didn't Mike Feinstein do Jungle Hunt? Carlos Smith did a great job on the 7800 Robotron, it was an awesome port.